Pa kimchi is a quick and easy side dish made using green onions or scallions that can be purchased in every market throughout the world. There are numerous kinds of kimchi recipe in Korea and pa kimchi is considered to be the easiest recipe to make. 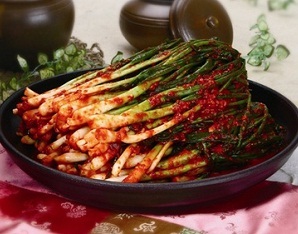 In place of cabbage or radishes, green onions/scallions are fermented and matured in gochugaru, garlic, ginger and variety of seasoning paste which leads to less crunchy and slightly bitterer kimchi than the napa cabbage styles. Pa kimchi is considered a low fat high energy, high fiber side dish that is an excellent source of calcium and vitamin C which can aide in blood circulation as well as cleansing.